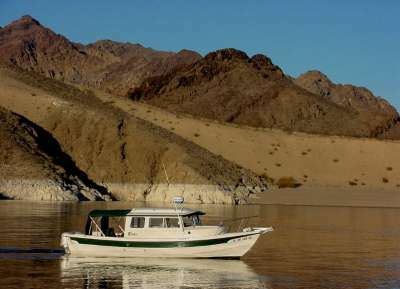 Launch: Callville Bay marina -quieter and more distant from the lights of Las Vegas than other marinas. Nearby campsites: Park service camp just above the marina. 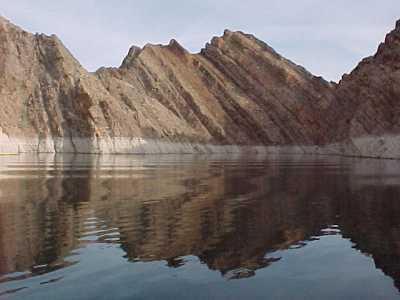 Comments: Lake Mead is divided into three major basins, each with their own characteristics. The farther east you travel, the more rugged and wild are the canyons and the vistas. -----Land has personality. Each of us reacts differently to every person we meet, and so it is with landscapes. 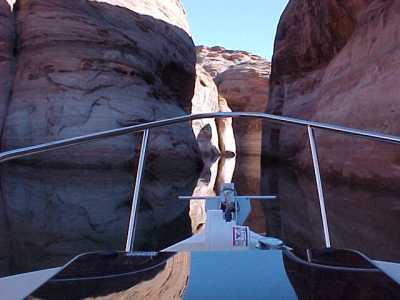 Lake Powell, for us, is mysterious, secretive, and beckoning. Lake Mead, on the other hand, is big, bold, brash, and often somber. Both are changeable and fickle friends, shifting psyches with the variable of weather. -----Both desert lakes reflect the nature of their unique geology. The stuff of rock and its history contours the land as surely as our genes and history shape us. Lake Powell is sandstone; Lake Mead is volcanic ash and lava, shale, and limestone. Water molds that rock, just as air shapes and modifies water. -----Most people live on the junction of air and rock - occasionally buffeted by either, or sometimes water. A tornado, earthquake, or flood makes the evening news, due to their rarity. 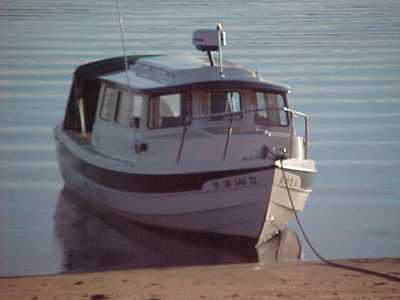 -----Boaters live on a different interface - air and water. Wind can gently rock us or give us a thrashing. Sleeping at night, on anchor, our bodies (our V-berth, our HOUSE) often swing through arcs of over 120 degrees. And neither waves nor wind shifts are rare events to us. -----For most, water is a place to visit and play - to ski, fish, surf, or swim - and it's delightful. We enjoy such play also - but for us the air-water interface is so much more. Embedded in boaters are the mirror images of affection and love - deep feelings of fear and respect. The difference is simple - we don't just visit for play, we live on the interface. We travel, sleep, eat, read books, write checks, answer the phone - all atop a fluid rippled or torn by wind. -----We willingly choose this life. The challenges faced by those living on water are not greater than those faced on land, simply different. Natural, more than human, forces affect boaters.